This is the final Big Red Recon before National Signing Day next Wednesday and it promises to be a wild ride for the Huskers over the days leading up to NSD. Nebraska fans will have a reason to tune in next week as a handful of Husker targets (RB Maurice Washington‍, CB Cam Taylor‍, CB Taiyon Palmer‍) plan to announce on Wednesday. Quarterback target Matthew Tago‍ announces Saturday, Feb. 3 at 7 pm CT and 4-star linebacker target Javontae Jean-Baptiste‍ could announce at any time. >>Speaking of Jean-Baptiste, here’s the latest I can share about his recruitment. As I reported on Wednesday, he will be taking a trip to College Station to visit Texas A&M for the Aggies' big final official visit weekend. Pass rusher is a position of need for the Aggies as well, but Jimbo Fisher may be too late to the party here. A&M’s defensive coordinator Mike Elko does have familiarity with Jean-Baptiste from his time at Notre Dame, but it’s not nearly the same relationship as Frost and company have built. It would be an upset if A&M ends up being the pick here. Battles for 4-star outside linebackers that can rush the passer are never easy. Nebraska, A&M, Ohio State and Virginia Tech all sent coaches to his house this week. I still feel good about Nebraska. >>Right now, all the momentum with a pair of official visitors from last week is with the Huskers. 3-star cornerback Cam Taylor and 3-star quarterback Matthew Tago are two players I expect to be in the class. Taylor is a favorite of defensive backs coach Travis Fisher, and makes a very intriguing corner prospect. Tago announces publicly on Saturday and he has been fairly quiet since his visit last weekend. I’m told this battle is coming down to Oregon State versus getting a shot at quarterback under Frost at Nebraska. Expect him to join the Big Red Revival on Saturday night. >>On Monday, I reported that Kansas offensive tackle Jalan Robinson‍ would be taking a mid-week visit to Nebraska. He did take that trip Wednesday and Thursday, and was accompanied by his coach Sam Stroh. From what I can gather, Robinson enjoyed the trip but the staff was very honest with him about spots being limited, and they told him they would know more after the weekend. He will still take his trip to Mississippi State this weekend, and I expect him to end up in the Bulldogs' class due to Nebraska hitting on some targets above him on the board. >>On Wednesday Nebraska sent six coaches to see running back Maurice Washington at his school. Frost was joined by Fisher, Ryan Held, Troy Walters, Sean Beckton and Barrett Ruud. After talking to a source close to his recruitment, that visit could not have gone better and went a long way to showing Washington how much Nebraska was locked in on him. Nebraska has done all it can in this recruitment including having Frost fly from Dallas to San Jose to meet with Washington’s mom Wednesday night. Frost was laying the groundwork for a closing visit this weekend to get Washington’s mom comfortable with the staff. Both Washington and his mom will be in Lincoln this weekend. >>I wanted to pass along a note on current Husker quarterback Tristan Gebbia. This isn’t surprising because we heard this last spring too but Gebbia is getting rave reviews from the staff and people around the team. His desire to lead vocally and by example has stood out quite a bit. 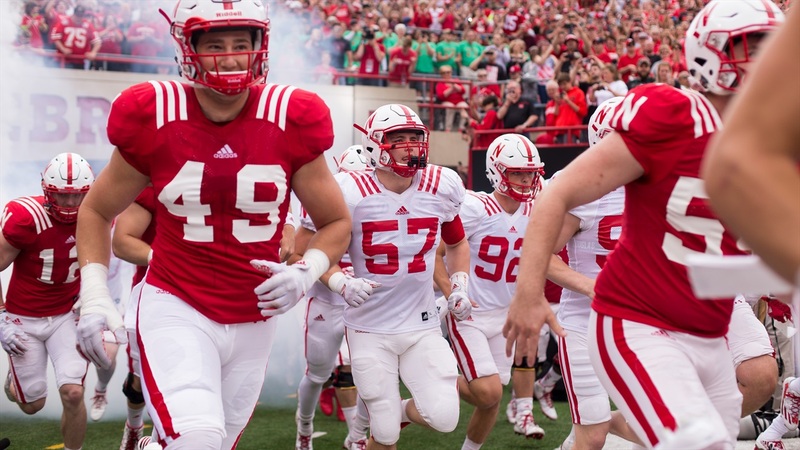 He’s also been the ultimate team player because he was the player host for Adrian Martinez, who he will now have to battle for the starting job. I don’t know if Gebbia will win the job (he has a great shot) but you need players like him in your program. >>On Tuesday, a new defensive back prospect, Joseph Norwood‍ entered the picture for the Huskers. Erik Chinander was supposed to visit him yesterday evening but that did not happen and Norwood will now not be visiting Lincoln this weekend. When I caught up with Norwood briefly, he just told me that "They got another guy, so they don't have a spot for me anymore." I liked Norwood’s film but this is a good thing for Nebraska. It means that either Cam Taylor, Ken Montgomery‍ or Taiyon Palmer is in. Nebraska is looking to take two of those three cornerbacks. >>In what will probably end up being something I mention every week until next signing day, I have a quick update related to the duo of Omaha Burke linebacker Nick Henrich‍ and tight end Chris Hickman‍. Ruud was back at Burke on Thursday, making it the fourth straight week that he went to the school. If Nebraska doesn’t land those two, you will not be able to say it was for a lack of effort on the part of the coaching staff. >>Another 2019 prospect you are going to hear a lot about in the coming year is 4-star quarterback Max Duggan‍ from Lewis Central High School in Council Bluffs, Iowa. Highly-rated quarterbacks are hard to come by in the area, so Frost will put a huge emphasis on Duggan who fits his offense perfectly. Duggan texted me this morning to let me know that Frost is visiting him at his school. He still plans to make a spring decision on which college he chooses.